Time is rushing by, summer is here at long last, and the nests on Isla Perdiguera are falling into disrepair. The one time tenants of those feather lined hollows are now taking to the air, but all is not entirely well on the desert island paradise. Roxanne’s latest report commences where the last left off, in early June. This is the eighth article in a series of ten. If you haven’t already read the others, start with the first article! 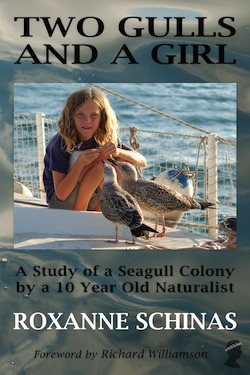 For the full story of Roxanne’s hand-reared gulls and her study of the yellow-legged seagull colony on Isla Perdiguera, buy her book, Two Gulls and a Girl. Remus and Romulina are great fun now. It was hard work getting them to this stage, but it was very worthwhile. 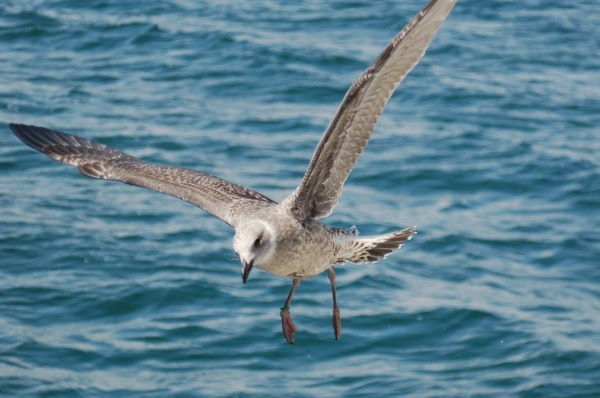 They can both fly well, and Romulina is capable of looking after herself when the sub-adults try to mob her. Actually, the sub-adults who used to chase our two babies don’t bother with them now. They know it is a waste of effort. Remus does still give us moments of worry. We haven’t forgotten that he once ate a pencil and a clothes peg, or that he fell off the cockpit seat, so we don’t quite trust him to keep himself safe. But Romulina is fine. She is a pretty, intelligent little bird. I have done well with her. She is a success and I am proud of her. She is friendly to me still, but wary of strangers and of the dog. Remus begs from anybody ( – if you are sitting down to dine al fresco, and a large gull lands in the middle of your lunch and starts squeaking, that’ll be Remus – ) but Romulina only squeaks when she sees me. She knows that I am her Mummy. This is strange really; it ought to be the other way around, because Romulina hatched in the nest and saw her real parents, whereas the first thing that Remus saw was me. 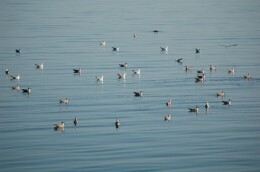 The birds spend most of the day playing with the other juvenile gulls on the water. What they would really like is for me to swim with them and their friends, and for me to sleep on the beach with them at night… Apart from anything else, I am sure that the friends would certainly not approve of this idea! 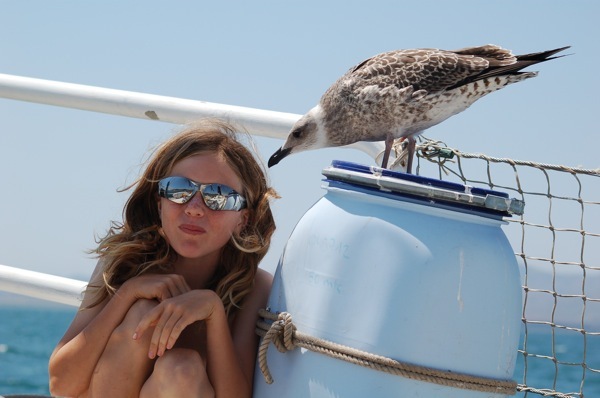 Romulina thinks that the next best thing would be for her friends to come aboard Mollymawk, but no matter how much evidence they receive to show that this is perfectly safe, the other juvenile gulls have never come aboard – yet. 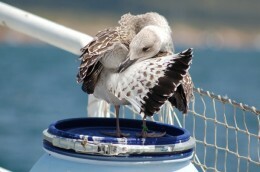 (We did have a couple of sub-adults land on deck while Remus and Romulina were chicks. At the time we naively assumed that they had maternal feeling towards the lost infants, but we now believe that it was just as well that the chicks were in their cage. JDS) Sometimes the other juveniles come very near to the boat. Once, when Romulina and Remus were sitting on the water at the stern, and I was throwing fish to them, a group of six other chicks inched closer and closer, but they never quite got near enough to join in with the feast. Romulina and Remus have learnt to come when they are called. When they were small I tried training them to come when I blew a whistle, but my brother and sister complained about the noise so I had to give that up. Then I found that the birds knew my voice, and because I always talk to them they had learnt their names. They are rather unreliable about coming. If Remus is playing with a fishing float or a piece of plastic, then he generally ignores me. However, if Romulina is on the water nearby she will come, and if she is on her aft perch, on the outboard, and I call to her from the bow, she will come at once, with a little cry. 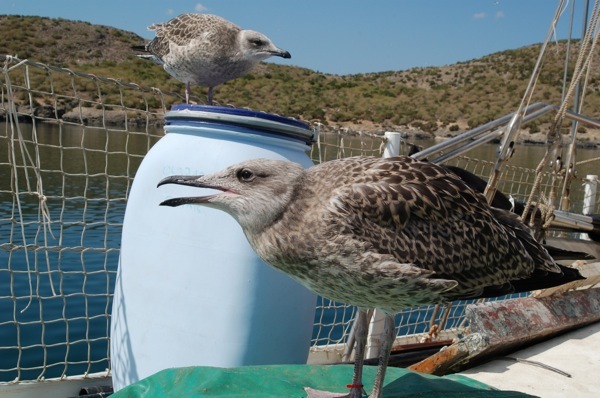 On the 6th of June at sunset hundreds of gulls, males and females alike, rose up from Isla Perdiguera and flew away together, heading northwards along the Mar Menor. There were less than half as many gulls as usual left on the island. The rest just disappeared over the horizon, all going within the space of five minutes, and most of them in the first minute. Where did the birds go? Was it a flying lesson for the juveniles? At first we were afraid that Romulina and Remus had gone, but when it got dark they came and flew round the boat, calling. They spent the night away from us, but at least we knew that they were still around. We don’t actually think that any juveniles went away with that big flock. On the 8th of June the wind came up from the north, and our anchorage off Barbecue Beach was no longer very safe, so we needed to move round to the other side of the island. It was evening time, and the birds just happened to arrive aboard at the moment when we were thinking about leaving, so the easiest thing was just to put them in their cage. (A quick word about the cage: we are very aware of the fact that our “pets” are actually wild birds, and we have never liked restricting their movements. The purpose of the cage has always been to keep them safe, rather than to keep them from being free. When they were learning to fly they could easily have hopped over the side while we were not watching and then been unable to get back aboard. When they were competent pilots but still unable to feed themselves we thought it best still to use the cage at night; otherwise, if the wind got up and we needed to move the boat, Romulus and Remus would have been left behind. The cage was quite large. It consisted of a length of plastic trellis balanced along the guard rail and, to the inconvenience of the rest of the crew, it occupied almost the entire side deck to port. After we put Romulina and Remus in their cage I sat and talked to them and fed them, but they paced up and down unhappily. By the time we arrived on the other side of the island it was dark, and since it was also blowing a gale we decided to leave the birds in their cage until morning time. In the morning it was still very windy, and we were worried about whether Remus would be able to fly in so much wind, but he and Romulina were both very agitated so we let them out. For a long time we thought that we had lost them both, but at about midday Romulina appeared alongside the boat. She was sitting on the water with another chick. When I called her she came aboard. It was quite hard for her to land in so much wind, but after she had practised for a bit she decided to show off, and she came and landed on my head! The people in the yacht nearby couldn’t believe their eyes! They got their binoculars out to take a closer look. By evening time Remus had still not returned and so Daddy and I went to look for him with the dinghy. Daddy rowed, and I called, “Romulina!”. We rowed towards the juveniles which were sitting in a crowd on the water, but I couldn’t see Remus and he didn’t come. It was getting dark. We were just about to give up when I heard a familiar, “Cheep, cheep, cheep!” I looked up and saw a big, bulky, long-beaked chick flying above us. Once he had worked out who we were I didn’t need to call him anymore. He gradually came closer, and eventually he landed on the water astern of us. Then he swam straight towards us, begging for food in his usual way. Usually when I pick him up he protests and struggles, but this time he just carried on begging as I lifted him aboard. His mouth was open wide, so I put him on my lap and dropped in a piece of cheese. After he had eaten several pieces he realised that the cheese was coming from a little box, so he stood up on my lap and lent forward and scoffed all of the cheese in the box. When we got back to Mollymawk he seemed glad to be home, but after his meal of fish he spread his wings and hopped into the air and disappeared back into the night. Perhaps he went to look for his sister. On the 10th of June we had to go and get food for the birds. Because they hate going in their cage we decided to leave them at the island. We left early in the morning, after the birds had been fed, and we would have to get back in the afternoon to feed them again. 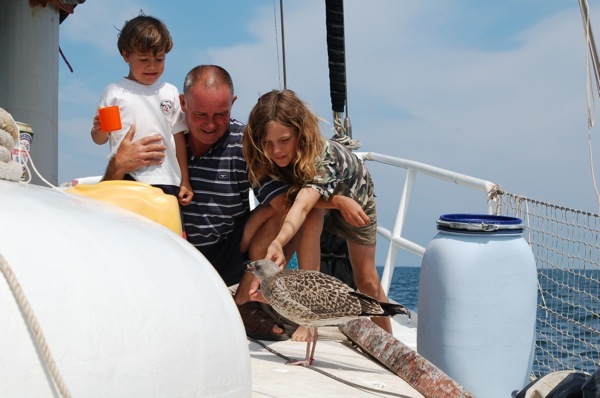 We sailed to Puerto Tomas Maestre, which is the place where we do the internet and get water. After we had done the shopping and stocked up on frozen fish we set off back to the island. 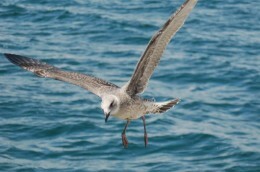 We were about half a mile from the island when I saw a juvenile flying above the boat. There were no other birds about. Suddenly I realised that it must be Romulina! “Romulina!” I called, and Romulina’s voice answered me. Clever little bird! She tried to land, but we had all of the sails up, and the wind was across the boat – and the boat was moving. She couldn’t land from her usual direction, and the rigging was in the way. She made several attempts, calling out all the time, and finally she succeeded in landing on the coachroof, where she used to land when she was still learning to fly. She stayed with us for the rest of the journey, and after we had anchored she flew away. Then Remus appeared, fed, and then left again. How did Romulina know that we were coming? She must have flown around the island, because the way we approached we wouldn’t be visible from the side where she and Remus were left. She must have been looking for us. She saw our little yellow island out in the sea, and she recognised it as her home, even though it looked very different with the sails up. 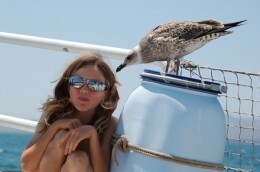 Gulls are much cleverer than most people would think. And their eyesight must be very good for Romulina to have been able to see us and recognise us from so far away. 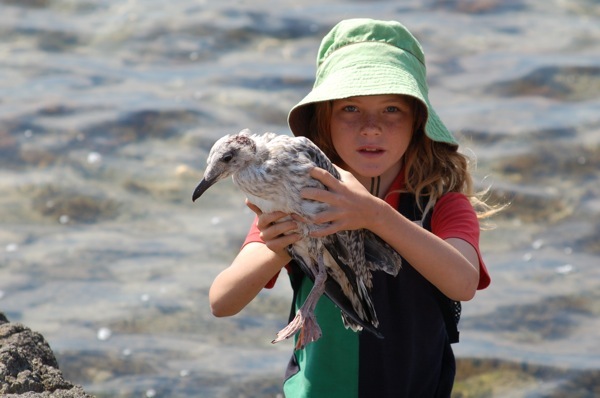 I hope she hadn’t been searching all over the Mar Menor, and worrying about where her home had gone. Not many gulls have a territory which moves! The next day we were making our tour of the island when I saw a juvenile gull standing near the edge of the water on the beach. (The beach is the place where the juveniles all get together once they have fledged. It is a no-man’s land – there are no nests and no territories here – and we have seen Romulina and Remus landing here, by the water’s edge. We think it is probably the only place that they have ever been ashore. JDS) The other birds had all flown away, but this one was dragging a wing. I crept up and caught him. It was not only his wing that was hurt. He also had a big wound and some gouges on his head. The feathers were gone, so that he was bald here. He also had a very nasty, bloody wound above his tail, on his back, but we only glimpsed this. It was obvious that he had been attacked by another gull, or gulls. It was not the sort of damage that a dog would do. He was about the right age to be learning to fly, and he had probably flapped away from his nest site on his first flight, and wandered into somebody else’s territory. 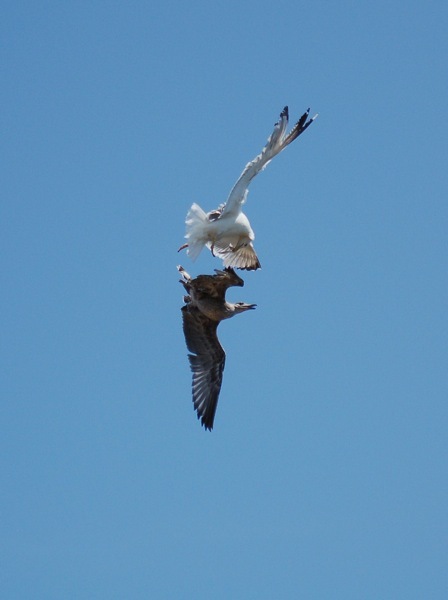 Or perhaps he had simply gone flying and been attacked by the sub-adults – two and three year old gulls – which chase and attack the fledglings. 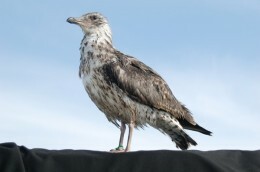 We were very surprised to find that a juvenile could be so badly injured by the other gulls. We have often seen fledglings being mobbed, but we have never seen one get hurt. In the attacks that we have seen the juvenile always escapes immediately. It was clear that the injured gull would not survive on his own, and we did not know where his parents’ territory might be. I wanted to bring him back to the boat, but Mummy said no, so I put him in one of the old ruins, left over from when the army used the island during the Spanish civil war, and we brought him some water and some white bait. As I suspected, the bird was dead in the morning. He even had maggots in his back. If he died during the night, or even the day before, the maggots would not have had time to hatch from their eggs. The eggs must have been laid by the flies while the bird was still alive, and judging by their size I think that the maggots probably hatched while he was still alive. They must have been eating the chick alive. Since this chick died we have found a total of 23 others with injured heads and wounded, torn backs. Three were still alive when we found them but they were dead by the next day. One was found in the late evening, just before dark, struggling out of the water. It was dripping blood and quivering all over. We put it in a bush to die in peace, unmolested. Most of the dead birds were found on the beach (ie. they had not been intruding on another bird’s territory).Only one was found near Barbecue Beach. One was so badly battered on its back that its rib cage was open! Why do the gulls do this to each other? 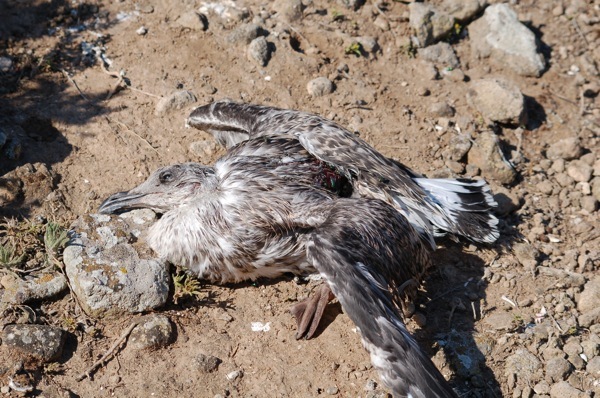 It is very upsetting to find young birds which have been carefully reared by their parents, and got as far as leaning to fly, being murdered by their own kind. If we had known, when Romulina and Remus were learning to fly, that the sub-adults really wanted to kill them, then we would have been even more worried. We cannot find anything about this killing in our bird books. Is it a new thing? Perhaps the sub-adults would usually be busy hunting for food, but here in this unnatural place there is plenty of food and so they are bored. (A comparison with human society seems relevant; are the gangs of gulls the equivalent of gangs of teenage youths looking for other, smaller kids to mug? Is gull society, which is so interlinked with human society, undergoing the same sorts of stresses as ours? Are there seagull psychopaths? Of course, we’re only assuming that it is the sub-adult yellow-legs who do the killing. We have never actually witnessed the event, but we have seen the sub-adults being very aggressive to the juveniles – and who else could be committing the crime? Sometimes, just after dark, all the birds go up with a great deal of noise. We wonder if this could be the time when the attacks occur – perhaps all the birds go up when the murderer strikes – but we have listened carefully and have noticed that the cries of alarm during these “night panics” are all adult ones; we do not ever hear the juvenile’s distinctive call for help during these panics. More probably the sub-adults see the new immatures as a threat. 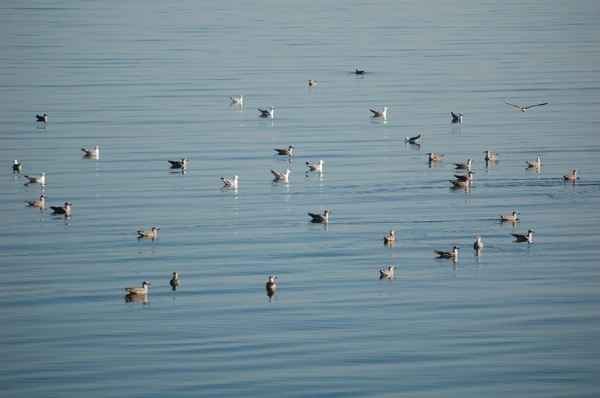 There are now hundreds of juveniles sitting on the water in flocks. There are three or four separate flocks, one off the main beach, one in Caleta Medusa, one of Barbecue Beach, and a fourth lesser one off the north coast of the island. These large numbers are probably alarming to the sub-adults. Maybe there will be competition for food and for a territory. There is really no room for any more nests on Isla Perdiguera. (Meandering, for a moment, from Roxanne’s thread, but pursuing her comment about territories and nests – I wonder whether adult gulls of breeding age aim to make their nests in the territory where they were born? Would their parents tolerate this, or would they drive them away? Perhaps the situation doesn’t arise; the gulls are not ready to breed until they are four years old, and by this time they may have forgotten which patch of rock was once their home. 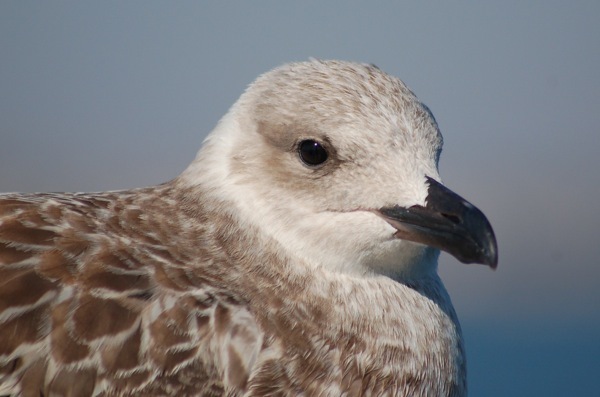 It seems that it is best for a young gull to fledge early on in the season, while there are few other juveniles on the water, and the sub-adults are not too concerned about them. Romulina and Remus were just about the first chicks to fly, and they are now too good at flying to be murdered by the older birds. Fortunately we don’t have to worry about them. It is the ones who are just making their first flights that get killed. 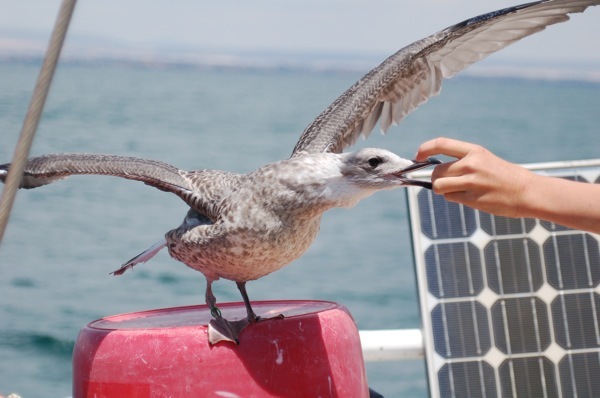 Be sure to visit next week for the penultimate episode of the Seagull Survey! Have loved reading about what you have done for these gulls – truly admire you – just contacting you in case you have any advice to offer – raised an abandoned seagull and it now lives on our roof – have always fed it good protein and this year has produced first baby with his mate! Trouble is, I am having big problems with my neighbours complaining about the noise and mess (won’t say what I think!) but I’m really worried how they are going to teach the baby where to feed (I live in Brighton) if I continue to feed them – but don’t feel I can just stop and abandon them now….any advice please – would be much appreciated?